Meg Braff tops my list of all-time favorite designers, and I am swooning over this gorgeous Southampton vacation home she decorated for a couple and their four children. Inspired by the ocean located just a few blocks away, Braff employed a palette of greens and blues against a backdrop of beige and white. Furnishings made from natural materials like jute, raffia, wicker, rattan, and bamboo add to the “beachy but refined” effect. Braff incorporated a few formal items previously owned by the homeowner to provide a dash of polish. 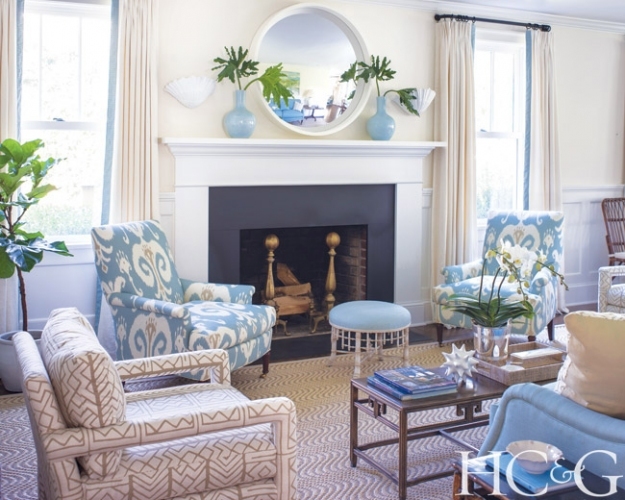 Let’s take a look inside this home, which is featured in the June issue of Hamptons Cottages & Gardens. A pair of Hickory Chair armchairs upholstered in Fabricut’s Definitely Maybe flank the fireplace in the living room. The library includes a Chippendale chair and a vintage rattan side table, both from Meg Braff Designs. The drapery fabric is Schumacher’s Seneca Cotton Stripe in Aqua/Mocha. Polished-nickel Reed fixtures from Circa Lighting hang in the kitchen, which features Silestone counters. 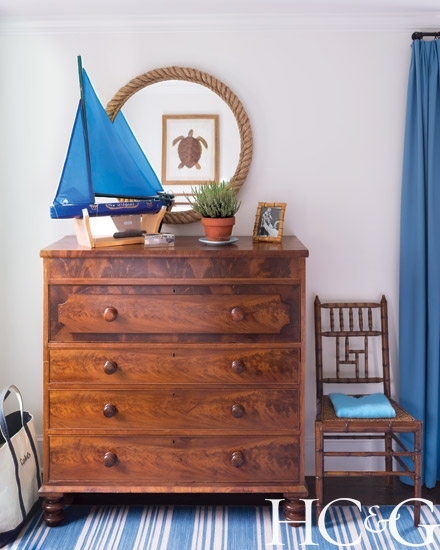 In a boy’s room, a model sailboat is shipshape against a rope-framed Pottery Barn mirror. 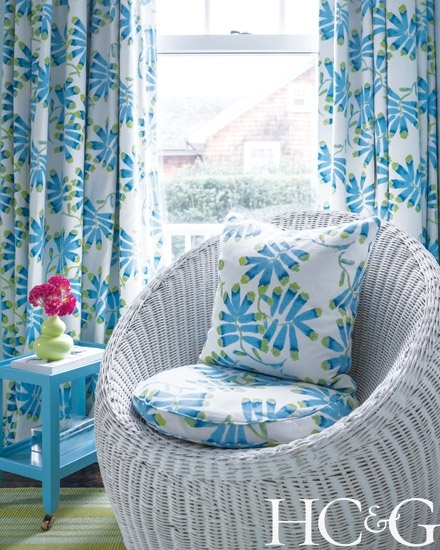 Braff used a SeaCloth linen/cotton for the draperies and chair cushions in the daughter’s room. 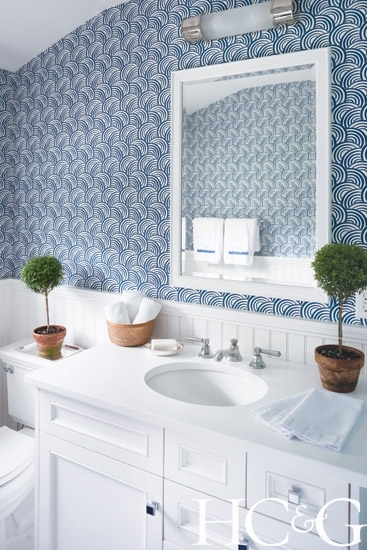 The boys’ bathroom features Braff’s Roxy wall covering. Lee Jofa’s Sant’ Elmo dresses up the headboard, bed skirt, and roman shades in a boy’s room. In the master bedroom, Norbar Fabrics’ Mateo in Seafoam covers the Braff-designed benches and Sherrill Furniture Company chaise. The Harlow console is from Bungalow 5; the draperies are made from a Jed Johnson Home fabric. 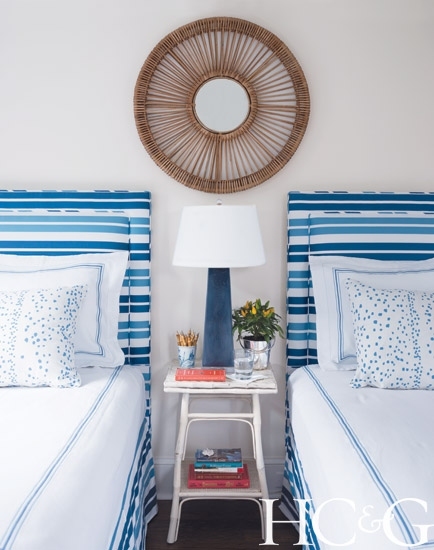 A boy’s room features Jane Wilner Design’s bedding and headboards upholstered in Lee Jofa’s Stripe It Up in Tide/Blue. 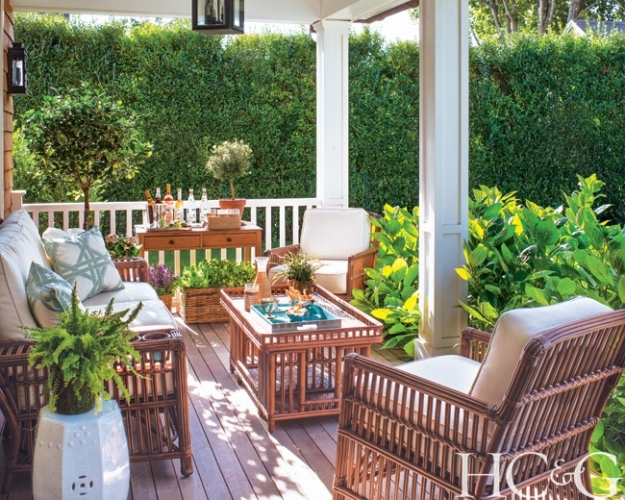 On the porch, rattan furniture features Ivory cushions from Palecek’s President’s collection; the accent pillows are upholstered in a Carleton V fabric. 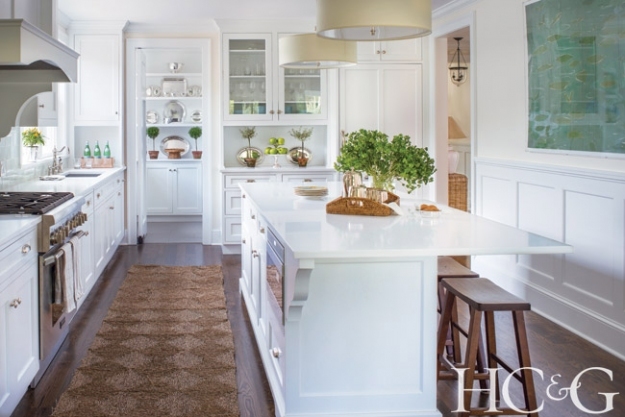 Click here to see more of this home, as featured in Hamptons Cottages & Gardens. You can see more of Meg Braff’s work here and here. Beautiful! Love all the rattan! That porch is perfect! Very pretty, feels so fresh and crisp perfect for the coast! Hope you are feeling great! Clean, crisp, and refreshing. Perfect for a summer home. Comme il faut, as the French would say! I love it its fun and yet classic and crisp too! Love Meg Braff and her clean, classic, comfortable style!